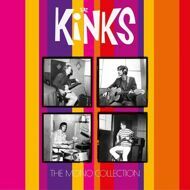 The Kinks – The Mono Collection Deluxe Vinyl Box of classic mono recordings, 10 discs from 1964–1969 all on 180g heavyweight vinyl. The Mono Collection packages the first 8 albums in mono, including Live At Kelvin Hall. The set also includes the bonus double LP compilation, The Kinks (aka The Black Album) and hardcover 48-page book including never-before-seen photos and new interviews with Ray Davies, Dave Davies and Mick Avory.